(PhysOrg.com) -- A new archaeological study in Britain has shown that its multi-cultural nature is not a new phenomenon, but that even in Roman times there was a strong African influence, with North Africans moving in high social circles. The study, led by Dr Hella Eckardt of the Department of Archaeology at Reading University, used pioneering forensic techniques to study fourth century artifacts and bones in the Yorkshire Museum’s collections in York. The researchers used isotope analysis and forensic ancestry assessment to analyze the items, which included the “Ivory Bangle Lady” skeleton and goods buried with her. The Ivory Bangle Lady remains were found in August 1901 in a stone coffin unearthed in Bootham, where a group of graves were found. The grave has been dated to the latter half of the fourth century. Items buried with the Lady included expensive luxury items such African elephant ivory bracelets, beads, pendants and other jewelry, a blue glass jug, a glass mirror, and Yorkshire jet. A rectangular bone mount, possibly for a wooden coffin, was also found in the grave. An inscription on the bone, “Hail sister, may you live in God,” suggests the woman held religious beliefs and may have been Christian. She is believed to have been one of the richest inhabitants of the city. The researchers analyzed and measured the Lady’s skull and facial features, and looked at the chemical signatures of her diet. They also examined the burial site to build a picture of her social status and ancestry. Dr Eckardt said the results showed the Ivory Bangle Lady was of mixed ancestry, and the isotope analysis suggested she may have migrated to Britain from a warmer climate. This evidence, along with the goods found in the ground, and the fact the burial rite was unusual, all point to the her having been of North African descent, arriving in Britain possibly via the Mediterranean, and she was of high social status. The analysis of the Lady and other skeletons and artifacts contradicts the popular assumption about Britain in Roman times that African immigrants were usually males, of low status, and most were slaves, and shows that high status women from Africa were also present in the society. Dr Eckardt said the research on the Lady and other skeletons suggest the society was as diverse, and possibly more diverse than it is today. The Roman Empire extended into the Near and Middle East, North Africa, and included Europe, and there were great movements of people throughout the Empire, both voluntary and involuntary. York (or Eboracum, as it was then known) was an important city of the period and eventually was named capital of “Britannia Inferior.” Emperor Septimius Severus, who was born in North Africa, was one of two Roman Emperors who visited Eboracum, and died there. The paper is published in this month’s edition of the journal Antiquity. The skeleton and artifacts will be displayed in August as part of the Yorkshire Museum’s exhibition: Roman York — Meet the People of the Empire. The Roman Empire was a multicultural empire, when Rome invaded Britain and settled, it wasn't as if all these citizens of Rome suddenly came to live - the 'invasion' was more a Romanisation of the inidgenous culture - as it was the world over. Once part of the Empire, trade and travel was widespread, and it's unsurprising that there were African, Middle-Eastern, Germanic as well as Italian 'Romans' all over every part of the Empire. 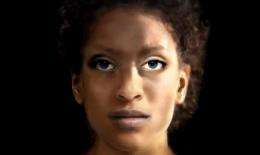 It seems totally in line.. after all one of the earliest Queens of Britian was black. To be precise: The prevailing language in the east was Greek. Not only during the times of Hellenism and the times of the Byzantine Empire. To speak of a "Romanization the world over" does simplify things a little bit. That was also an oversimplification. While it is true that the dominant language in the East was Greek, it doesn't follow that they were not 'Romanized.' In fact, the East, including modern -day Greece, was very much transformed by the Romans. The Roman system of government and commerce was imposed. Indeed, the ancient Greeks actually called themselves Romaioi, which means "Roman." There has been a systematic glorification of the ancient Greeks over that of the Romans here in the West, especially in Anglo-centric countries. But the "glories" of ancient Greece are not so glorious. True, they started the ball rolling on a few key things. But that pales in comparison the to achievements of both Republican and Imperial Rome. Hey I started a "my ancient civilization was better than yours" flame war! As a relic of a bygone age of classical education, I studied both ancient Greek and Latin at school, and was amazed by both cultures. I think if any single simple device divides them, Greece was more intellectual, Rome more engineering. The Romans admired the earlier Greek culture and adopted many of its principles. Indeed, the Greek were great thinkers, the Romans were great a putting these greek thoughts into practical use, kind of like the Chinese today, mass producing products based on principles developed/discovered by western science over the last 200 years. Crackpot theories supported by zero evidence are not welcome on a science forum. Please, I beg you, at the very least present a vioable argument that casts a shred of doubt to the official history! But don't forget the heirs of the western Roman Empire who threw all of Europe into 1000 years of cognitive darkness while other cultures flourished. Rome lasted a long time, and the Republic and Imperial phases different in nature. Most of the excesses of Rome came from the Imperial half, with the whims of Emperors taking precedence over the Republican (and quite modern) ideals of patricians and plebians sharing power to some extent. Shame to tarnish 5 centuries of relative civilisation with decline into decadence of the latter half. It could also be argued that it was the constitutional catholic church that plunged everyone into the Dark Ages, rather than Rome itself. What defines 'black' and why? I was referring to Queen Philippa of Hainault bethrothed to Prince Edward III in 1327. I have found a website reference for you where she is discribed as brown from head to foot. Their son was called Edward of Woodstock after his birthplace and refered to as the Black price... to be honest no one knows why. the Plantagenets is refernce for this era i believe. in other words either this is the absolute first case of black being used to desribe someone who is brown all over or it means something else altogether. Roman achievements: Pax Romana; the Republic, the true model for modern democracy, which was contemporaneous with Greek democracy; system of law, e.g. Justinian Code; engineering on an unequaled scale, including roads, bridges, and aqueducts still used today; cement, including a type that can cure underwater; a civilization that endured from 753 BC until at least 1453 AD, if not to this day (one could make a strong argument that we are the inheritors of Roman civilization, as our governments, social structure, art, history, languages, literature, and philosophy are all rooted in ancient Rome, either directly, or through the Roman Church); indoor plumbing and central heat; cities with populations of a million people; public sanitation; and so on. Greek achievements: stole alphabet from Semitic peoples; fought a lot, conquering sometimes, but mostly being conquered; ostracizing people; restricting citizenship to the rich; and a woeful inability to make anything last. It's interesting to note that you regard an economy which is based on killing and enslaving millions of people as "welfare state". The empire of Rome was not built on slavery, it was built on order. Slavery was involved, yes, but find me a culture of the day that did not engage in slavery. Conquered peoples were slaves initially, however, shortly after their acceptance of Roman social standards (running water, public games, etc) the Romans would bring them into the fold and provide them with a voice in the Senate (where applicable) or a reponsible govenor to watch over their affairs. Yes, some of these were mad men and brutal people, but find me a culture that has existed in harmony since their initial creation. You futher state that China is a result of "destructive" western imperialism. How do you suppose China would be supporting their population today if it were not for western technology and civilization? The challenge for grass roots Christians then and now is to understand faith cannot be forced. There's nothing grass roots about Christianity today. The Christian message resonated with an ignorant and often oppressed population. The Christian message was not heard by politicians until power changed hands to a Christian influenced ruler, Constantine, a Dacian, by way of his mother as a final spite against Diocletan, considered one of the greatest Christian persecutors. Why did Constantine 'get religion'? It couldn't be he would have considerable wide spread popular support? No it was because his mother told him to. He did whatever his mother advised him to do on social affairs. She was a Christian forced to marry a pagan who slaughtered Christians. Helenism arose partially due to spite for Diocletan, also because it granted great wealth to the Helenic kindgoms to do as Constantine said to do. Again, absolutely nothing grassroots about that. Real power rises from below. Politicians attempt to tap into that power and sway it their way. Obama tried that and is not having much success. I haven't seen him fall from power, have you? Have you seen a bill he's signed not go into the legislative body? How exactly is his power reduced? "True power comes from the barrel of a gun." US citizens have many firearms in spite of government attempts to take them away. If politicians want to go that route, they will fail miserably. And how about outside of the US? You do remember that there are another 193 countries to account for, correct? And approval ratings are relevant how? Since this is now a political debate..
After listening a few of the many addresses over the last month I don't believe Obamma actually cares who's in charge of Congress as long as things start to actually get done. He comes across as a centrist which is ideal for a president. The extremes are not feasiable to implement in any government. I wouldn't call him a socialist, this is branded on him because of the health bill & the reprisal of wall street. But, like any politicain he does things for show that he knows will never get approved - like that 90% taxation on AIG bonuses, people wanted to hear it but it never got passed. Good Luck.. He's asking Congress to vote yes on a pay and perks cut. Would you give up free money??? The system is broke. Long live the system!!! Mere pikers compared to the Muslims who have shut down the productivity and creativity of now 1 billion people for ~1400 years. A significant majority of citizens oppose Congress' take over of the medical industry. Hey marjon, your real name wouldn't be Frank Luntz by any chance? I'll toss you a bone, Frankie: those polls might actually have meant something, if only the people polled knew what they were opining about. Personally, I *still* have no idea what's in that bill. And I don't believe any person outside of DC has any more clue than do I.
I will not support it, because I have no idea what it's about. Neither will I oppose it, for exactly the same reason: because I have no idea what it's about. You, on the other hand, will oppose it, not because you know what's in it, but because that's Frank Luntz' prescribed reaction. If the legislation was so great, why were three states exempted from certain provision to buy votes? When senators from the same party must be bribed to vote for a bill, it must not be a very good bill. Could be any number of reasons. Chief among them, keeping major campaign contributors happy. Both parties are heavily captive to established industry, whence comes the impetus for opposition to reform. North Africans are not black. Why is the woman depicted as being so? North Africa isn't just ancient Egypt; it includes today's Libya, Algeria and Morocco. Morocco in particular is the historical home of the Moors who spread Islam into Spain. Right, but many of the Moors were "black" by modern definition. 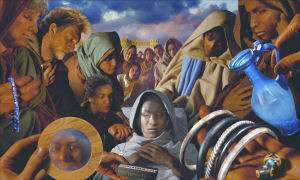 The picture of the Ivory Bangle Lady certainly is not out of line with the looks of a Moroccan or Algerian, which are just as multi-ethnic as Egypt. THe Moors never took England -- so wha tis the reference pertaining to again?